GERMANY: Revenue from newly commissioned onshore wind farms helped push up utility-developer EnBW's earnings in the first half of the year, the company stated. Its earnings before interest, tax, depreciation and amortisation (Ebitda) for its renewable energies segment during the first six months of the year was €164.6 million — up 8.1% from the corresponding period one year earlier. The German utility explained that this was primarily due to the contribution made by onshore wind projects commissioned in the last 12 months, and to higher production levels in its river-based hydroelectric plants. This increase in earnings also came despite lower energy yield at its offshore wind farms, the company added, without providing a figure. It expects its renewable energies unit’s earnings to increase further in 2018 with higher output at its hydroelectric projects and contributions from the 70MW of onshore wind farms it commissioned in the first half of the year. 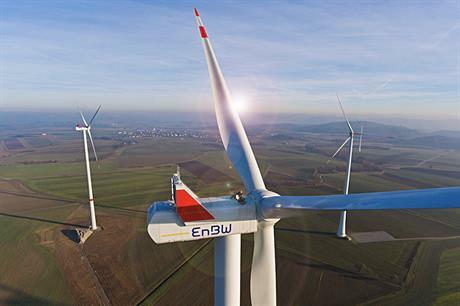 Meanwhile, EnBW reduced investment in its renewable energies segment to €164.4 million — down from €291 million in the first six months of 2017. This was because investments in its Hohe See and Albatros projects "will only be made in the subsequent quarters". In the first six months of the year, EnBW secured contracts for new onshore capacity, began work on offshore wind farms, and participated in research projects "investigating various different concepts for floating offshore wind projects that would be suitable for opening up new international offshore wind regions". Elsewhere, it won three projects with a total output of around 19MW in the German onshore wind tender in May. The company also started construction at its 497MW Hohe See wind farm in German waters and plans to start installation of the neighbouring 112MW Albatros project in September.